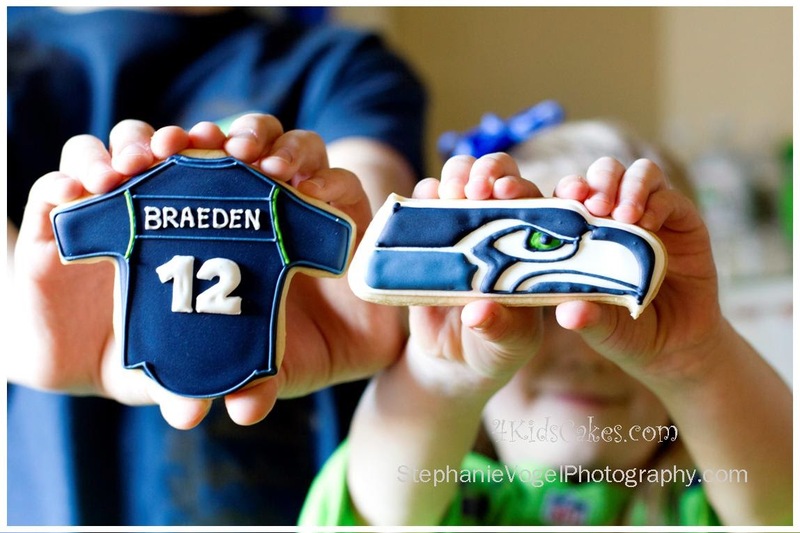 How do you celebrate your favorite NFL team? With a 12th Man party of course! Here in the NW, we have a huge fan base for our Seahawks, that are loud and proud. Wanting to switch things up from the usual football decorations, we purchased NFL window clings to decorate candy jars. Shabby sisters made an adorable distressed wooden sign & Shontay had the perfect wreath to tie it all together. A fun Superbowl t-shirt from Sports Connection was a comfy option if you don't have your own jersey. 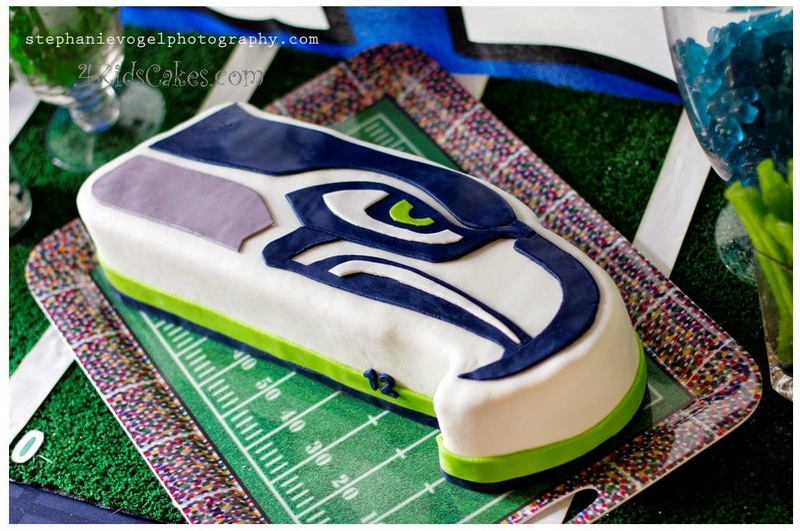 For the dessert table, a Hawk cake with a touch of the "12" on it was the perfect touch. 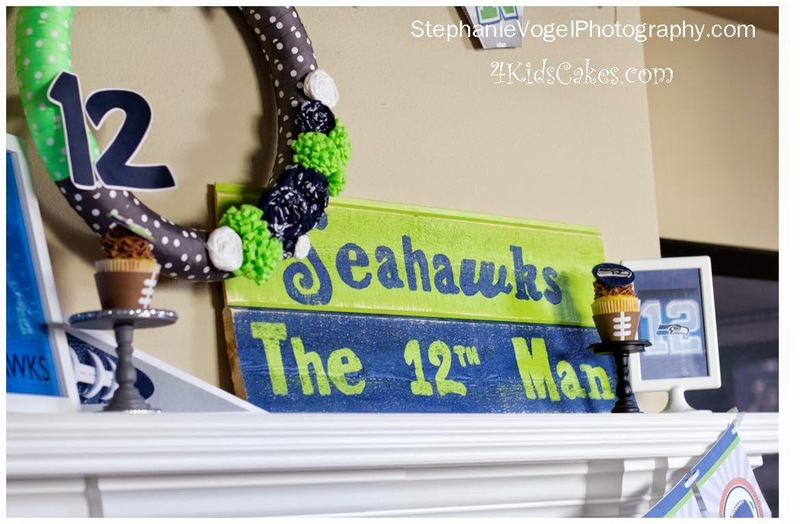 To create the backdrop, we used the 12th Man Flag & made paper chains like from when we were all kids. 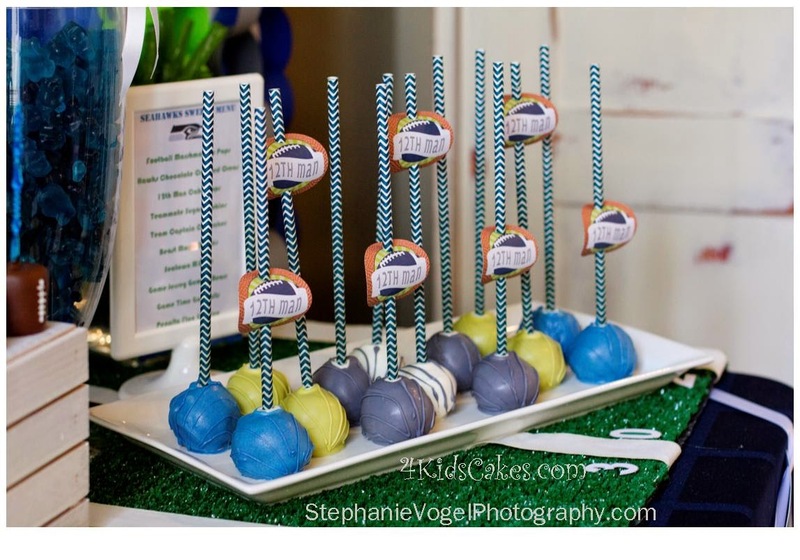 Cake pops & chocolate covered oreos are always a tween favorite & had to be part of the display. 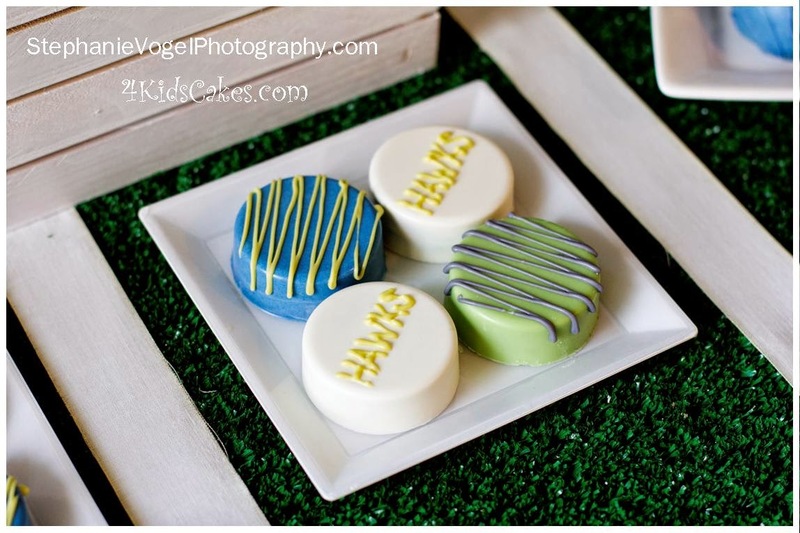 Fondant topped cupcakes with fun sayings from favorite players were added. Cookies from Sweet Themes Bakery was a must. My kids are lucky that I make all the other treats their hearts desire - but when it comes to gorgeous cookies - I am happy to support Sweet Themes. They totally outdid themselves. Marshmallow pops decorated as footballs (on skewers from Party City) gave us the football element. 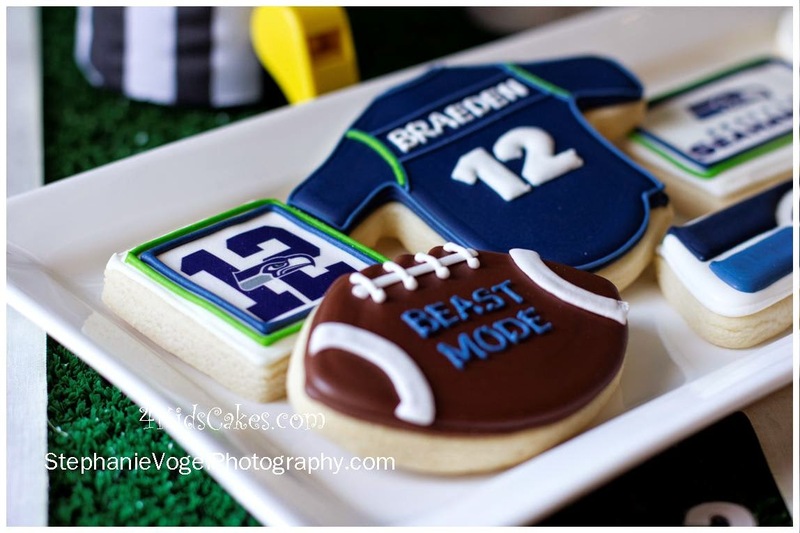 No Seahawks party is complete without Skittles candies. A staple at any grocery store you would think....but fans here are so enthusiastic, they were hard to come by around the Superbowl! 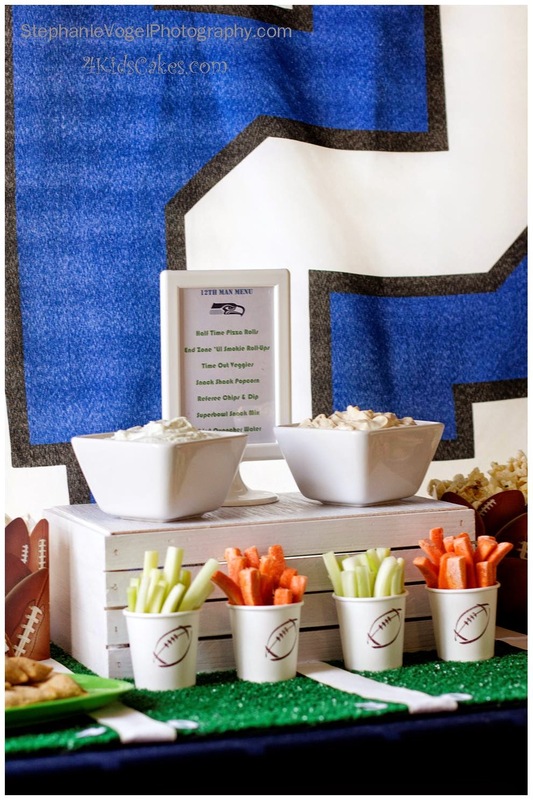 Seahawks player Marshawn Lynch eats them before every game, and they have become a game day necessity around here. They even have a burger at the stadium that is served with a side of skittles! Our football pops were chocolate dipped marshmallows with a little white chocolate pipped on for the balls stitching. The blue & green sticks in them are neon skewers from Party City (we left out the orange and green). 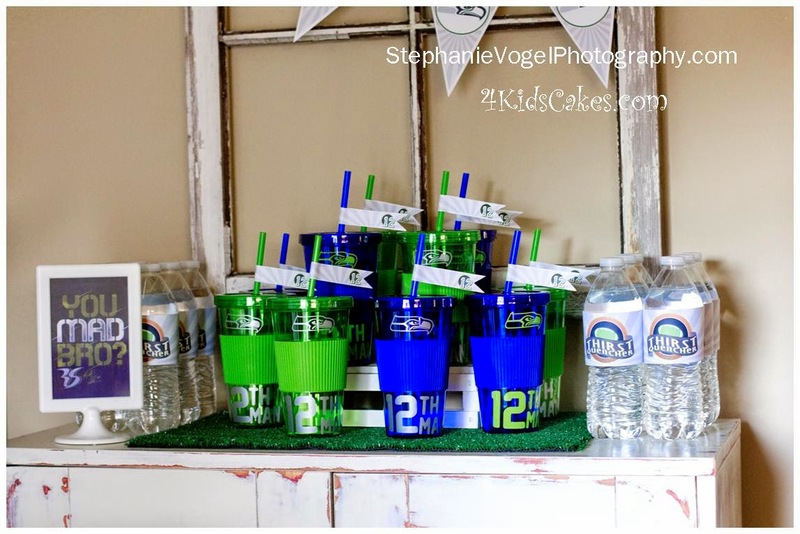 Blue and Green cups from the dollar store were embelished with vinyl I had a friend cut out for me & turned them into Seahawks cups. Add a printable flag from PartyOn!Designs and they were a hit & a favor all the tweens could take home. Munchies included chips, popcorn in adorable favor boxes from Banner Events, and a few other items. We stamped footballs on cups from PartyOn!Designs to hold our veggies. It was a fun Birthday party that could easily be twisted into a game day party or tail gate.